heard and felt the rumblin' (my apt./rutherford) and sure enough i missed it ! some tankers, lumbers,flats with pipe,boxes, etc. and know which industries are along the line? That would be H07 headed west to Hillburn (Suffern) and Campbell Hall. He brings the loads up and empties back, usually returning just ahead of the AM rush. The largest segment of traffic he carries is covered hoppers of grain headed to Bay States Milling in Passaic (I think that's what town its in) about a mile or so east of Paterson on the original Erie Main Line. This train also carries ethanol for Black Prince in Clifton, bulk commodities for the transfer facility in Paterson, plastic pellets for several customers, lumber for several customers, flour for Nabisco in Fairlawn and Zarega Pasta also in Fairlawn, chemicals for Jones Chemical on the Hudson Secondary (by Campbell Hall) and seasonally, road salt for the customer in Waldwick who gets about 100+ carloads each fall to sell each winter to surrounding towns, in addition to others. Proven Theory #2 - If you don't work for the railroad, you don't know more than the people who do, no matter how many years you've hung around the tracks, or how well you think you understand railroading. thanks for all the info...quite interesting. a new layout so this might be cool to use as a protoype. what kind of power is used for these longer trains that run to campbell? i'm still exploring places in NJ in general...very cool. Wow, looks like you almost formed the picture of a covered wagon with your unique typing style. "Each of us makes his own weather, determines the color of the skies in the emotional universe which he inhabits." Location: NJ and me, Broke Together! i forgot to post this. On wednesday night around 8pmish, i was down in saddle brook near the nysw yard off of midland waiting for the su-99 to head out. If waiting for a bit, you can catch as many as 6-8 njt trains on the main line. Well that night i heard the horns as they crossed over market going west. Well this was a freight, had a sd70m-2 as a leader and gp40 trailing, had maybe 30 cars. Was nice to catch it. We throw any engines together to run that train. I remember on the 8th of this month I had 5 engines and a Gp38 was the leader followed by 2 Dash 9's and 2 Dash 8's. If i am only come back with 10 - 20 empties we get 21m's power which are usually 2700 series. If I am coming back with more than 20 we get mixed power and pull right into the yard leave it running for a 33k crew to take the empties to allentown. Bano which is the larger of the freights up the bc line? i've seen 1 large one about a year ago and thats it besides detours. The largest freight up the BC line is by far the H07. If we run everyday the train is an average of 20-30cars. 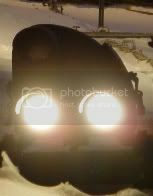 There are times that the train does not go out because of manpower reasons that we get a huge train easily 60 or more cars. The H82 is short the most I had was 10 cars when I ran that. bano, i just saw your other post about on duty times. the h07 doesn't work on fri/sat? So is sunday the best chance for a decent freight? The H07 is a 5 day a week local Sunday through Thursday. The crew goes on duty only on sundays at 1pm. It should be a nice size train. The 32a runs everyday so figure thursday, friday and saturday those cars been in the yard. Should be more than 50 cars. i wish i was able to take a vacation day for tomorrow. Stuck at work till7am. Wouldn't mind catching it. one of these sun. nights i'll get lucky...lol. The H07 is due through rutherford tomorrow anywhere from 2pm on. I am working the H81 Pascack Valley local with me red caboose.....lol...til the end of the month.